The church was delighted to host a meeting organised by Cllr Melanie Whitehand and supported by the Knaphill Residents’ Association to highlight the recent spate of anti-social behaviour observed around Knaphill, and to hear from the Police and Crime Commissioner and local Police Commander about their strategies for Surrey And Woking Police. The Police And Crime Commissioner, David Munro, spoke first about the political and financial challenges facing policing and his approach to supporting the Surrey Force, before Divisional Commander Inspector Andy Greaves explained his priorities and strategies for policing in Woking in the face of limited and stretched resources. Inspector Greaves reminded the audience that reporting every incident is essential, however trivial, as it allows them to build a much better picture of behaviour and crime in Woking, and that will help focus their priorities. He also stressed recent changes to policing which will see Police Community Officers returning to the streets of Woking, a move the audience welcomed. 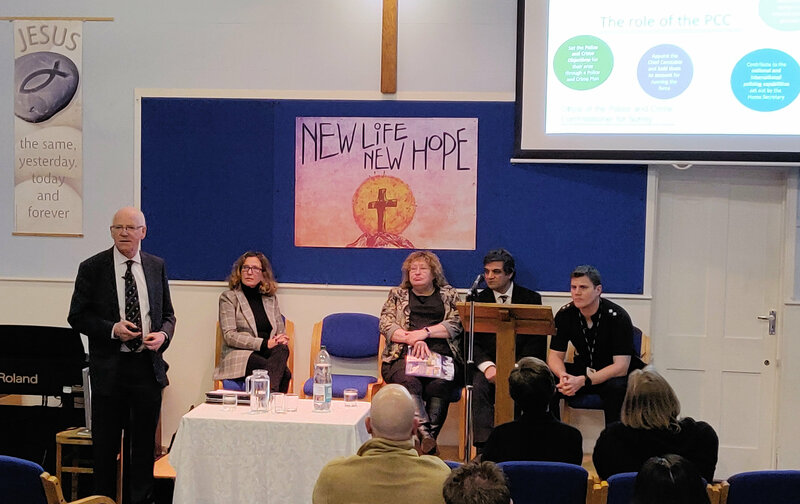 A packed church was then invited to put questions to the panel, which also included Cllr Whitehand, Cllr Debbie Harlow and Cllr Saj Hussein, Knaphill’s Councillors on Woking Borough Council. Throughout the responses, the overall message remained that whilst the issues in Knaphill are recognised, police priorities remain counteracting drug dealing and more serious violence in Woking Town Centre and east of Woking. However it was hoped that the renewed presence of PCSOs in Knaphill will go some way to addressing the residents’ concerns.